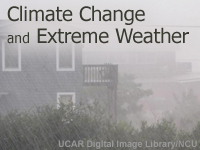 This module discusses how a changing climate can also lead to changes in extreme weather events on the local scale. The role of natural variability is also explained. The module describes how climate change can have both positive and negative effects, depending on the situation, location, and the vulnerability of the population. While research on climate change and extreme events is still relatively new, the module discusses what changes scientists think are likely if greenhouse gas emissions continue to rise. Interesting points made on a controversial subject. It would be great to deepens the topic. It brought an understanding of climate change that I did not understand prior to this module, Gave me more knowledge for understanding climate change compared to what you see mentioned on news and media. I think that this lesson wasn't as dummied down as it could have been for people that don't have the best understanding on geography. Great explanation of how climate changes are changing our weather patterns globally. I won't recommend anything on MetEd. This lesson is actually very interesting. Im from Malaysia working with Malaysia Meteorological Department. With this kind of method and education, its really help a lot. Thanks MetEd. It was a great experience in doing this topic, it gives me a better understanding of it as well. This module is essential information for our leaders in government because it makes the important point that the frequency of extreme weather events such as heat waves, floods, and droughts, are likely to increase with global warming. This module refutes the fact that one cold wave is proof against global warming, a common claim used by denialists with malicious political agendas. A very brief but informative base level knowledge on the subject. Easy to understand regardless of age or background. Short sweet and effective lesson. Good quick course to learn more on the subject! Well presented overview. Taught in a way that was easily understood by a beginner. Very good. Just what is relevant to the stated topic and clearly organized and communicated. Very informational although, visuals were a little vague. this helps with my career.as well as this is what I started studying in 2004. I really enjoyed this module as I found it to be not too long and it had an enjoyable mix of narrative, charts/graphics but also little videos and was put forward in a simple and clear way that made it interesting. Definately recommend! Thanks Meted! Excellent overview with easy to follow graphics, animation, and narrative.